Dr Nazier Khan died tragically on 31 December 2011 at the age of 37. Nazier matriculated with distinction from Alexander Sinton Senior Secondary School in Athlone in 1992. His strong sense of identity and social purpose began during these schooldays and time of great change in our political landscape. Nazier was an avid sportsman, participating in first-team cricket, rugby, league tennis, swimming, long-distance running and shot put. His school years were some of his fondest memories and the beginning of lifelong friendships. 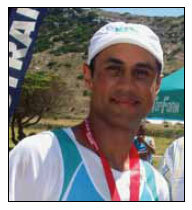 Nazier graduated MB ChB from Stellenbosch University in 1999, where he continued with cricket, running, and golf, and took a keen interest in university community outreach programmes. He completed his internship at Groote Schuur Hospital in 2000, and his community service in 2001 at Tygerberg Hospital and Vanguard Community Health Centre, where he became an adept surgeon. He spent some time as a senior house officer in medicine, and almost 2 years at G F Jooste Hospital. Nazier joined the UCT Department of Medicine in 2005 as a registrar and obtained his fellowship from the College of Physicians of South Africa in 2010. In 2011, having sourced private funding, he commenced his training under Professor Rayner in the Renal Unit at Groote Schuur Hospital to subspecialise in nephrology. At the time of his death, he was working on many research projects, including the impact of 'tik' abuse on the development of severe hypertension and chronic kidney disease in the Western Cape. He was a strong advocate for a patient-centred approach to medicine and improving access to healthcare. Obsessively thorough in every aspect of his work, Nazier never spared himself or lowered his standards. He worked with vigour and enthusiasm while displaying a most critical faculty. Nazier's opinion was sought after by his colleagues and he gave his advice freely and in a forthright manner. He was a most popular member of staff, liked by nurses, doctors and staff in other disciplines. He spent time tutoring medical students. Overcoming many personal difficulties, he demonstrated his indomitable spirit to reach personal and professional success. He embraced life, and enriched the lives of all with whom he came into contact. He was thoughtful and cared greatly for everyone he knew, giving his best, and spurring us on to do the same. Nazier was an accomplished runner, having completed several marathons including the Comrades, the Two Oceans and the Mumbai marathon. His energy and intensity brought out the 'champ' in anyone who took to the road with him. He was an avid hiker and loved climbing Table Mountain - sadly coming to pass doing what he loved. He had excellent culinary skills and was also a high-quality dilletante barista. He was a loving father to Farheen, whom he treasured, and a devoted son to Hamieda and Abdool Gafoor Khan. Nazier truly loved life and the people who shared it with him. He was a dedicated physician and his death is a loss to Groote Schuur Hospital and society at large. He lived a full life despite his untimely death. Peace be with him.